Let’s browse the FAQ list and find out what you’re wondering about. However if you have any other inquiry, please send us an email and we’ll add your question, – and our answer-, to this list. Thank you! A: We advise to book to avoid disappointment, but it remains possible to walk in most weekends and during school holidays. Check our colour-coded calendar: green means you can turn up on the day (but booking remains advised for groups), orange means booking is compulsory, red no availability. Booking is quick and easy using our on-line booking form. A: Maximum weight is 120 kg (19 stones). There are lower limits for the kids courses: 40kg for the Possum and Pukeko Courses and 70kg for the Makimaki and Kiwikiwi Courses. We provide different sizes of harnesses and full-body or chest-harness are also available to ensure everybody is safe and comfy. A: Wear casual all-round clothing. Shoes which enclose the entire foot are essential; jandals, slip-on shoes or “crocs” are not suitable. You’ll wear a climbing harness, so avoid too short shorts and tops. Scarves and loose or baggy clothing is not permitted. Long hair must be tied back, and jewellery and body piercing should be removed or taped over… A light rain-jacket will be useful when a few showers are forecast (we’re open rain or shine, except really bad weather). Please wear a beanie or a hood if you dye your hair to avoid staining the helmet provided. Q: How long can I stay in the park? A: Adult or child entry pass is valid for three hours, including the induction briefing. Tamariki Pass is valid for one hour. You are welcome to stay longer to enjoy the park, but please return the safety gear as soon as you have finished to climb, or when your time is off. The park usually closes at 5pm; your pass expires when the park closes, even if you have started less than 3 hours before. Q: Can I do the courses more than once? A: Yes, of course, – as long as your pass is still valid -, usually 3 hours. It allows to go on any course and replay some at your leisure. There are lots of different levels so each participant can make their way and progress at their pace, that’s a true challenge by choice. Q: What happens if the weather is very bad? A: The canopy offers some protection and you may not be bothered by the odd shower. We close the park when it’s unsafe to operate, for example due to strong gusty winds. If you have made a booking, we will be in touch as soon as possible to arrange another day. Any deposit will be refunded in full if we have to cancel for bad weather or Acts of God when it’s not possible to postpone. However, no refund can be claimed once the session has started and it’s not possible to complete all the circuits. Q: Can family or friends watch us from the ground? A: Families are welcome of course; there are pathways winding through the bush and the trees so spectators can stroll along, with picnic tables to chill out or share the birthday cake! Q: Will there be instructors to help us? A: The park and safety systems are specifically designed to allow you to go by yourself up in the trees. On arrival, our staff will make sure your safety gear fits well, explain how it works and brief you along several workshops on a practice until you are familiar with your equipment and the procedures. From then, you will be allowed to go on your own, at your pace, on the high circuits. Our staff patrols the park continuously, ready to help any participant in trouble. Q: Can the children go alone on the circuits? 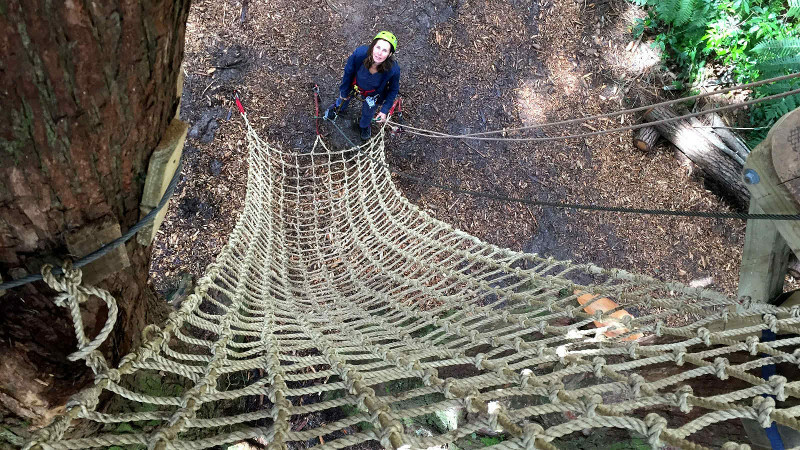 A: Yes, we offer different courses, especially designed so children can climb on their own. Our continuous lifeline system ensures they remain attached. However, there is still an element of risk when undertaking challenging activities at heights, and adult supervision is required, which can be properly achieved from the ground in most of the cases (details in our safety section).